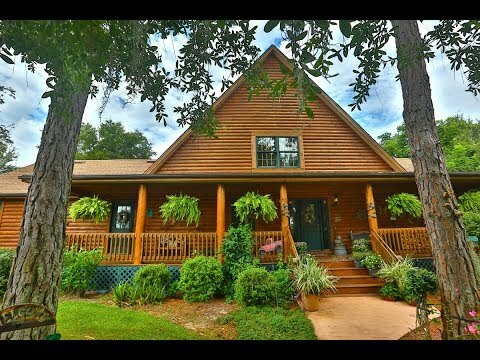 Craftsman charmer with magnificent views of both sunrises and sunsets and beautiful views of Lake Fay! Family room with soaring wood beam ceilings, wall of windows with gorgeous views and a wood stacked-stone fireplace. Spacious kitchen with raised bar sitting area complete with overhead lighting, center island, slate flooring, and is open to the dining area with views of the property. Master suite with stone fireplace, adjoining master bath features walk-in shower plus a claw foot tub for relaxing. Second Master suite with sliding doors opening to porch master bath with claw foot tub. Loft is open to the first floor family room and could be used as a bedroom, game room or use of your choice. Oversized porches plus a screen enclosed front porch is perfect for afternoon gatherings enjoying the sunsets in the evenings. Paved sidewalk leads you down the path to the lit dock and lake. Immaculate landscaping, property totally fenced with butterfly gardens. Truly unsurpassed quality in this rustic charmer! Country Club of Ocala – 1.23 Acres – Just Reduced!